To some, high-intensity internal workouts are the most efficient way of exercising; to others, they are a bizarre three-minute self-torture ritual. Although at times it may seem like the world is being overtaken by the overachieving and impossibly healthy, there are some who still prefer to keep their exercise routines a bit more humane. Most of us learn to walk by the time we’re eighteen months – so let’s talk about an exercise routine so easy that even a baby can do it. 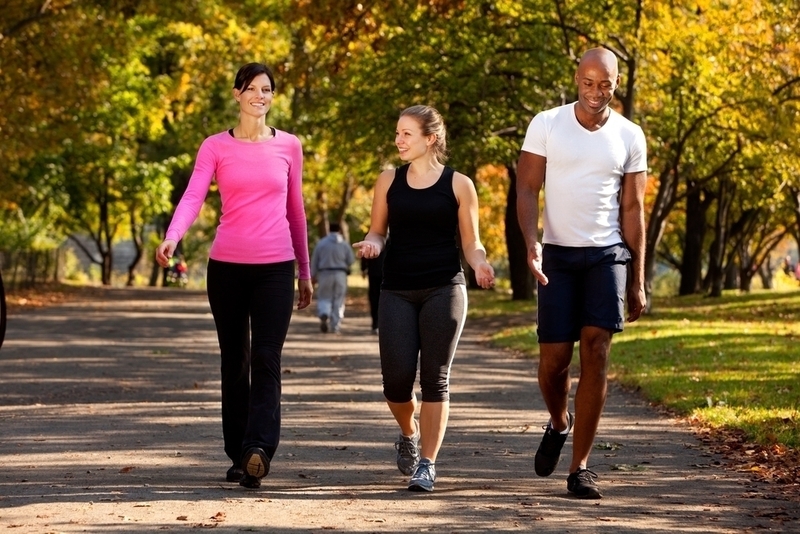 Here are some tips for beginning a summer walking routine. The first thing you need for walking is a good pair of shoes and some comfy clothes. Start out slow. Head out the door, walk for ten minutes and walk back. Repeat every day for a week. If you find yourself building stamina, add five minutes to next week’s walk. Keep increasing as is comfortable. Keep good posture in mind when you walk. Walk tall. Keep your mind on elongating your body. Your head should be up, your eyes focused forward, Keep your shoulders down, relaxed and back, with your abdominal muscles and buttocks tight. Make sure to have water handy at all times. Be sure to get enough to drink before you walk, and take the water bottle along for mid walk hydration. Try adding stretches to your routine. For example, you might start at a slow pace and stop to do a few warm up drills for flexibility. Slow down your pace at the end of the walk and take some time for a few more stretches. This will help you to feel better while preventing injury. The toughest thing for most people starting a fitness routine is making it routine. You should try to walk daily, aiming for a minimum five days of exercise per week. Walk fast enough to increase your heart rate, but not so fast that you find yourself short of breath. People walking for general health benefits should try and get in a half hour minimum each day, most days of the week, keeping to “talking pace,” or a comfortable pace at which you can still hold a conversation. For improvement of cardiovascular fitness, three to four days a week are recommended, doing 20 to 30 minutes at a very fast pace. You will find your breathing is elevated, but you should not be gasping for air. Warming up and cooling down time should be additional to the time spent walking. Those walking to lose weight should probably aim to do 45 to 60 minutes five days a week at a moderate to brisk rate. The faster you walk, the more calories you will burn. However, make sure to increase pace and mileage gradually to prevent injury. Use good posture. Walk tall, keep your gaze forward, focused about 20 feet ahead of you, chin level and head up. Your chest should be slightly raised with your shoulders down, back and relaxed. Your arms should be bent at an angle slightly less severe than 90 degrees. Gently cup your hands and swing arms front to back. The faster you swing your arms, the faster your feet will go, but do not swing elbows higher than your breastbone. Tighten abs and buttocks; keep back flat and pelvis slightly forward. Visualize yourself walking in a straight line.Take smaller faster steps to go faster, trying not to elongate your stride. Push off with your toes, concentrating on landing on your heel and rolling through the step. Use the spring of your calf to propel you. Take deep rhythmic breaths to get the maximum amount of oxygen. Your breathing should be heightened, but not strained. Have you started your summer exercise routine? How are you staying hot this summer? Let us know!